A blog dedicated to the genius Larry David. Season 9 Episode 1: Foisted! Larry tries to rid himself of an inept assistant, offends Jeff’s barber and gets into hot water over a new project. We’ve all been waiting anxiously for 7 years and on Sunday night we found out what Larry has been cooking up since 2011. It turns out he’s been penning a play for Broadway called “Fatwa!” based on Salman Rushdie’s life after receiving the death sentence of Ayatollah Khomeini. Only Larry could conceive such a scenario and it looks like a season arc will build from here. It also seems like the wedding of Susie and Jeff’s daughter Sammi may also be part of the season’s story. Ashly Holloway who plays Sammi is now 25 which is a reminder just how long ago Curb premiered (17 years ago in 2000). 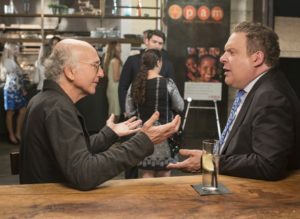 Season premieres have often been used by Larry in recent seasons to lay the groundwork for plot lines and characters that he will eventually weave into the tapestry of a ten episode long season. Season 9’s premiere is no different, and whilst it isn’t a riotous half hour, there are definitely some laugh out loud moments. From the opening scene of Larry trying to open a bottle of liquid soap (reminiscent of him trying to tear through the plastic packaging of his GPS) we are treated to the familiar curmudgeon we’ve come to know and love. Many of the series regulars return including Cheryl, Susie, Jeff, Leon and even Ted Danson for a brief appearance. Richard Lewis also returns and it is his 2 minute scene with Larry that stole this episode for me. The comedic chemistry and timing between these two old friends is a joy to watch. You can’t help but grin when hearing Richard berate Larry for being a “prick” after Larry sent an insensitive text when Richard’s pet parakeet died. I’m pretty sure even the two of them couldn’t avoid chuckling through their scene and they cover it brilliantly. The improvisation is brilliant. Leon, who now appears to live in some type of granny flat at Larry’s house, also returns and over the course of the episode assumes the role of Larry’s assistant. This seems like a great development for Leon’s character, and should see plenty more moments for these two unlikely friends to continue “lampin” and generally creating trouble. Jimmy Kimmel also does well as one of several guest stars set to make their appearance this season. Larry to Susie, “Oh like you’re a paragon of tastes” as he points at her dress. Constipation support groups. A much under researched and underfunded affliction. Larry imitating a parakeet that Richard believes was saying “Seinfeld””. “I don’t live in a cubic dance hall! Posted on October 4, 2017 by Alex. This entry was posted in Curb Your Enthusiasm, News and tagged Curb Your Enthusiasm, episode review, hbo, larry david, season 9. Bookmark the permalink.